1,1,1,2-Tetrafluoroethane (also known as norflurane (INN), R-134a, Freon 134a, Forane 134a, Genetron 134a, Florasol 134a, Suva 134a, or HFC-134a) is a hydrofluorocarbon (HFC) and haloalkane refrigerant with thermodynamic properties similar to R-12 (dichlorodifluoromethane) but with insignificant ozone depletion potential and a somewhat lower global warming potential (1,430, compared to R-12's GWP of 10,900). It has the formula CH2FCF3 and a boiling point of −26.3 °C (−15.34 °F) at atmospheric pressure. R-134a cylinders are colored light blue. Attempts at phasing out its use as a refrigerant with substances that have lower global warming potential, such as HFO-1234yf, are underway. 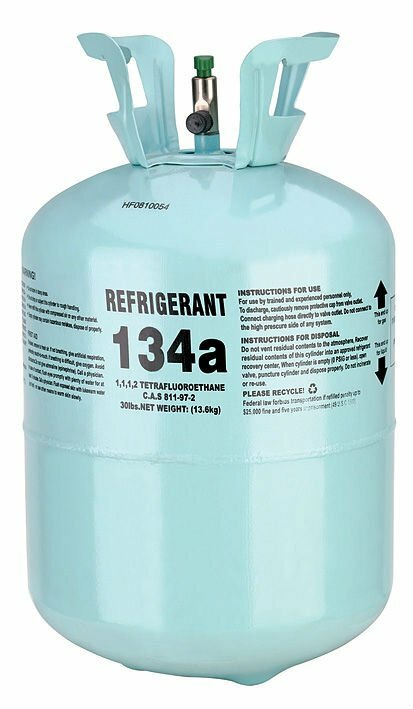 1,1,1,2-Tetrafluoroethane is a non-flammable gas used primarily as a "high-temperature" refrigerant for domestic refrigeration and automobile air conditioners. These devices began using 1,1,1,2-tetrafluoroethane in the early 1990s as a replacement for the more environmentally harmful R-12 and retrofit kits are available to convert units that were originally R-12-equipped. Other uses include plastic foam blowing, as a cleaning solvent, a propellant for the delivery of pharmaceuticals (e.g. bronchodilators), wine cork removers, gas dusters, such as Dust-Off, and in air driers for removing the moisture from compressed air. 1,1,1,2-Tetrafluoroethane has also been used to cool computers in some overclocking attempts. It is the refrigerant used in plumbing pipe freeze kits. It is also commonly used as a propellant for airsoft airguns. The gas is often mixed with a silicone-based lubricant. Tetrafluoroethane, when compressed as inside gas duster cans, is a clear liquid which boils when exposed to atmospheric pressure at room temperature (as seen here) and can be extracted from common "canned air" canisters by simply inverting them during use. 1,1,1,2-Tetrafluoroethane is also being considered as an organic solvent suitable for extraction of flavor and fragrance compounds, as a possible alternative to other organic solvents and supercritical carbon dioxide. It can also be used as a solvent in organic chemistry, both in liquid and supercritical fluid. It is used in the resistive plate chamber particle detectors in the Large Hadron Collider. It is also used for other types of particle detectors, e.g. some cryogenic particle detectors. It can be used as an alternative to sulfur hexafluoride in magnesium smelting as a shielding gas. 1,1,1,2-Tetrafluoroethane is also being considered as an alternative to sulfur hexafluoride as a dielectric gas. Its arc-quenching properties are poor, but its dielectric properties are fairly good. Recently, 1,1,1,2-tetrafluoroethane has been subject to use restrictions due to its contribution to climate change. It has a global warming potential of 1300. The Society of Automotive Engineers (SAE) has proposed 1,1,1,2-tetrafluoroethane to be best replaced by a new fluorochemical refrigerant HFO-1234yf (CF3CF=CH2) in automobile air-conditioning systems. California may also prohibit the sale of canned 1,1,1,2-tetrafluoroethane to individuals to avoid non-professional recharge of air conditioners. A ban had been in place in Wisconsin since October 1994 under ATCP 136 prohibiting sales of container sizes holding less than 15 lbs of 1,1,1,2-tetrafluoroethane, but this restriction applied only when the chemical was intended to be a refrigerant. However, the ban was lifted in Wisconsin in 2012. During the time that it was active, this Wisconsin-specific ban contained loopholes. For example, it was legal for a person to purchase gas duster containers with any amount of the chemical because in that instance the chemical is neither intended to be a refrigerant  nor is HFC-134a included in the § 7671a listing of class I and class II substances. 1,1,1,2-Tetrafluoroethane first appeared in the early 1990s as a replacement for dichlorodifluoromethane (R-12), which has ozone depleting properties. 1,1,1,2-Tetrafluoroethane has been atmospherically modeled for its impact on depleting ozone and as a contributor to global warming. Research suggests that over the past 10 years the concentration of 1,1,1,2-tetrafluoroethane has increased significantly in the Earth's atmosphere, with a recent study revealing a doubling in atmospheric concentration between 2001 and 2004. It has insignificant ozone depletion potential (ozone layer), significant global warming potential (100-yr GWP = 1430) and negligible acidification potential (acid rain). Because of its high GWP, 1,1,1,2-tetrafluoroethane has been banned from use in the European Union, starting with cars in 2011 and phasing out completely by 2017. Mixtures with air of the gas 1,1,1,2-tetrafluoroethane are not flammable at atmospheric pressure and temperatures up to 100 °C (212 °F). However, mixtures with high concentrations of air at elevated pressure and/or temperature can be ignited. Contact of 1,1,1,2-tetrafluoroethane with flames or hot surfaces in excess of 250 °C (482 °F) may cause vapor decomposition and the emission of toxic gases including hydrogen fluoride and carbonyl fluoride. 1,1,1,2-Tetrafluoroethane itself has an LD50 of 1,500 g/m3 in rats, making it relatively non-toxic, apart from the dangers inherent to inhalant abuse. Its gaseous form is denser than air and will displace air in the lungs. This can result in asphyxiation if excessively inhaled. This is what contributes to most deaths by inhalant abuse. Aerosol cans containing 1,1,1,2-tetrafluoroethane, when inverted, become effective freeze sprays. Under pressure, 1,1,1,2-tetrafluoroethane is compressed into a liquid, which upon vaporization absorbs a significant amount of thermal energy. As a result, it will greatly lower the temperature of any object it contacts as it evaporates. This can result in frostbite when it contacts skin, as well as blindness upon eye contact. For its medical uses, 1,1,1,2-tetrafluoroethane has the generic name norflurane. It is used as propellant for some metered dose inhalers. It is considered safe for this use. In combination with pentafluoropropane, it is used as a topical vapocoolant spray for numbing boils before curettage. It has also been studied as a potential inhalational anesthetic, but it is nonanaesthetic at doses used in inhalers. ^ Global Warming Potentials of ODS Substitutes Ozone Layer Protection US EPA. Epa.gov (2006-06-28). Retrieved on 2011-08-21. ^ "Table 2.14 (Errata). Lifetimes, radiative efficiencies and direct (except for CH4) GWPs relative to CO2". Archived from the original on 6 July 2017. Retrieved 11 July 2017. ^ "Example image of a 30 lbs R134a bottle". budgetheating.com. Retrieved 26 March 2018. ^ Corr, Stuart (2005). "1,1,1,2-Tetrafluoroethane (R-134a): A Selective Solvent for the Generation of Flavor and Fragrance Ingredients". Natural Flavors and Fragrances. ACS Symposium Series. 908. p. 41. doi:10.1021/bk-2005-0908.ch003. ISBN 0-8412-3904-5. ^ Abbott, Andrew P.; Eltringham, Wayne; Hope, Eric G.; Nicola, Mazin (2005). "Solubility of unsaturated carboxylic acids in supercritical 1,1,1,2-tetrafluoroethane (HFC 134a) and a methodology for the separation of ternary mixtures". Green Chemistry. 7 (4): 210. doi:10.1039/B412697A. ^ Abbott, Andrew P.; Eltringham, Wayne; Hope, Eric G.; Nicola, Mazin (2005). "Hydrogenation in supercritical 1,1,1,2 tetrafluoroethane (HFC 134a)". Green Chemistry. 7 (10): 721. doi:10.1039/B507554H. ^ Anushree Ghosh STUDY OF GLASS RESISTIVE PLATE CHAMBERS (RPC) AND CALCULATION OF EFFICIENCY Archived 7 August 2011 at the Wayback Machine. INO Graduate Training Programme DHEP, TIFR, Mumbai. ^ M. Capeans, I. Glushkov, R. Guida, F. Hahn, S. Haider (CERN, Switzerland) RPC operation at the LHC experiments in an optimized closed loop gas system. Medical Imaging Conference. 25–31 October 2009. ^ Norbeck, E.; Olson, J. E.; Moeller, A.; Onel, Y. (2006). "Rad Hard Active Media For Calorimeters" (PDF). AIP Conference Proceedings. 867: 84. Bibcode:2006AIPC..867...84N. doi:10.1063/1.2396941. Archived from the original (pdf) on 23 March 2012. ^ Magnesium recycling in the United States in 1998. (PDF) . USGS. Retrieved on 2011-08-21. ^ Gaseous dielectrics with low global warming potentials – US Patent Application 20080135817 Description Archived 13 October 2012 at the Wayback Machine. Patentstorm.us (2006-12-12). Retrieved on 2011-08-21. ^ European Directive 2006/40/EC relating to emissions from air-conditioning systems in motor vehicles. (PDF) . Retrieved on 2011-08-21. ^ Compressed air dusters and environmental concerns. (PDF). Retrieved on 2015-05-26. ^ HFO-1234yf A Low GWP Refrigerant For MAC Archived 27 February 2009 at the Wayback Machine. Refrigerants.dupont.com (2011-08-17). Retrieved on 2011-08-21. ^ California restricts use of HFC-134a in cars. 27 June 2007. R744.com. Retrieved on 2011-08-21. ^ a b Chapter ATCP 136. MOBILE AIR CONDITIONERS; RECLAIMING OR RECYCLING REFRIGERANT. State.wi.us. (PDF) . Retrieved on 2011-08-21. ^ Class I Ozone-depleting Substances. EPA.gov. Retrieved on 2011-08-21. ^ Franklin J (1993). "The Atmospheric Degradation and Impact of 1,1,1,2-Tetrafluorethane (Hydrofluorocarbon 134a)". Chemosphere. 27 (8): 1565–1601. Bibcode:1993Chmsp..27.1565F. doi:10.1016/0045-6535(93)90251-Y. ^ "Greenhouse gas monitoring at the Zeppelin station – Annual report 2004 (TA-2110/2005)" (PDF). Norwegian Institute for Air Research. Archived from the original (PDF) on 30 October 2007. Retrieved 19 January 2006. ^ Forster, P.; et al. (2007). "Changes in Atmospheric Constituents and in Radiative Forcing." (pdf). Climate Change 2007: The Physical Science Basis. Contribution of Working Group I to the Fourth Assessment Report of the Intergovernmental Panel on Climate Change. Archived (PDF) from the original on 24 July 2010. ^ "Refrigerant 1234YF's Potential Impact in Automotive Applications" (PDF). Archived (PDF) from the original on 13 July 2013. Retrieved 2013-07-10. ^ DuPont (2004). DuPont HFC-134a— Properties, Uses, Storage, and Handling (PDF) (Report). Retrieved 5 August 2016. ^ Honeywell International (December 2005). "MSDS # GTRN-0047 For Genetron 134aUV". ^ Alexander D. J; Libretto S. E. (1995). "An overview of the toxicology of HFA-134a (1,1,1,2-tetrafluoroethane)". Hum. Exp. Toxicol. 14 (9): 715–20. doi:10.1177/096032719501400903. PMID 8579881. ^ G. E. Millward; E. Tschuikow-Roux (1972). "Kinetic analysis of the shock wave decomposition of 1,1,1,2-tetrafluoroethane". The Journal of Physical Chemistry. 76 (3): 292–298. doi:10.1021/j100647a002. ^ Sellers, William F. S (2017). "Asthma pressurised metered dose inhaler performance: Propellant effect studies in delivery systems". Allergy, Asthma & Clinical Immunology. 13. doi:10.1186/s13223-017-0202-0. ^ Huchon, G; Hofbauer, P; Cannizzaro, G; Iacono, P; Wald, F (2000). "Comparison of the safety of drug delivery via HFA- and CFC-metered dose inhalers in CAO". The European Respiratory Journal. 15 (4): 663–9. doi:10.1034/j.1399-3003.2000.15d07.x. PMID 10780756. ^ "1,1,1,2-Tetrafluoroethane". Occupational Safety & Health Administration. ^ "Norflurane-Pentafluoropropane Aerosol, Spray". WebMD. ^ Shulman M, Sadove MS (1967). "1,1,1,2-tetrafluoroethane: an inhalational agent of intermediate potency". Anesthesia and Analgesia. 46 (5): 629–635. doi:10.1213/00000539-196709000-00029. Wikimedia Commons has media related to Tetrafluoroethane. "The Coexisting Curve of the Refrigerant HFC 134a: Some Scaling Models" (PDF). Archived from the original (PDF) on 29 September 2006. Retrieved 11 September 2007.